All modern birds fall into either (1) the palaeognathae, which contains the flightless ratites (including Africa’s ostrich and New Zealand’s kiwi birds) alongside the volant (flighted) tinamous of Central and South America, or (2) the incredibly diverse neognathae, which contains more than 99% of all living birds. Despite its comparatively small number of representatives, the palaeognathae boasts some of the most interesting and contentious questions in avian phylogenetics and evolution. Historically, the flightless ratites were thought to be sister to the flighted tinamous. This hypothesis, suggesting only a single loss of flight for the monophyletic (belonging to a single clade) ratites, was supported morphologically (by physical characteristics) and by most early molecular studies. However, as mitochondrial (mt) and nuclear genomics improved in the mid 2000’s, a different story began to emerge. Left: An illustration of a Moa next to three Kiwi by By Josef Kořenský (1847 – 1938). 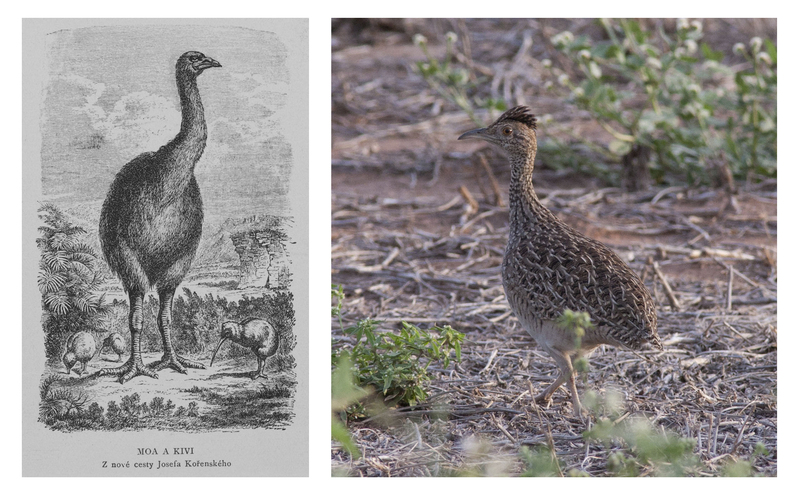 Right: A bushland tinamou (image credit: Flicker). Numerous research groups have now independently reached a similar conclusion: tinamous are embedded within the ratites, suggesting either numerous losses of flight in ratites, or a single loss of flight in the palaeognathae ancestor followed by a recovery of flight in the tinamou ancestor. The ratite phylogeny has also been greatly clarified by these groups and there are now a number of consistencies. The ostrich is basal to all other paleognaths, the emu and cassowaries are sister groups to one-another and are most closely related to the kiwis, and the rheas are on a branch by themselves. Two recent papers focusing on the palaeognathae phylogeny (Baker et al. 2014, Mitchell et al. 2014) still contain disagreement on which species the rheas are basal to. These two manuscripts are particularly notable for their use of ancient DNA (aDNA), allowing for the inclusion of extinct paleognaths: Madagascar’s elephant birds and New Zealand’s moas. These two species, both island endemics (species restricted to an island or island chain) driven to extinction less than 700 years ago, clearly displayed the gigantism common to many paleognaths, with the largest elephant bird reaching a height of 3 meters and weighing over 800 pounds. Although these studies are not the first to report ratite aDNA sequences (see Cooper et al. 2001, Haddrath & Baker 2001 and Phillips et al. 2010), the techniques used and conclusions drawn are greatly important to this field. Figure 1. Palaeognathae phylogeny as proposed by Mitchell et al. (2014). This tree was constructed using mtDNA. Branch support is given by Bayesian posterior probabilities and maximum likelihood bootstraps. Branches given maximum support are starred (*). The most surprising of this year’s manuscripts is certainly Mitchell et al. (2014). By sequencing the near-complete mtDNA of two elephant birds through hybridizing aDNA to RNA baits, they found that these Madagascarian mega-fauna are most closely related to kiwis (Figure 1, above). This contradicts the classic “vicariance hypothesis” that flightless paleognaths speciated alongside the break-up of Gondwana, and instead, suggests that all ratites were flighted as they dispersed. 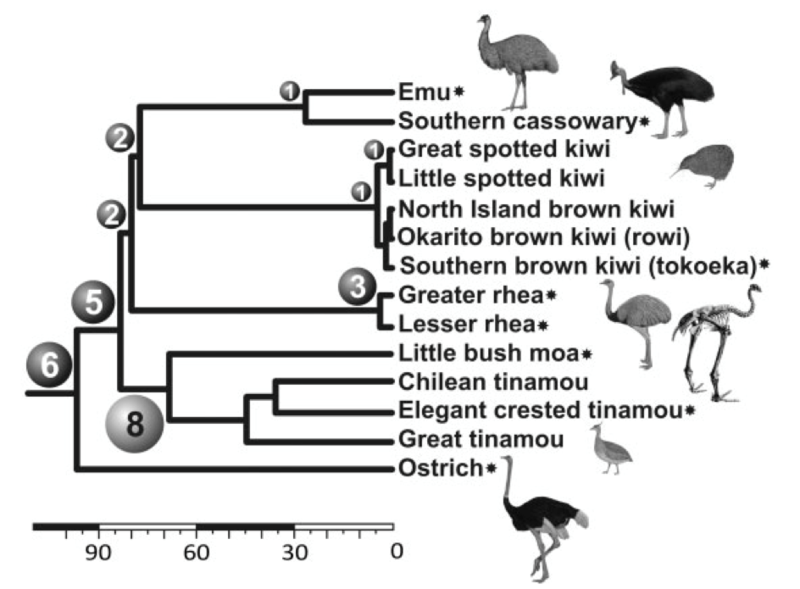 Alongside the mtDNA, morphological and nuclear data were added to phylogenies, and a number of kiwi/elephant bird-specific traits were uncovered. The authors suggest that not only has flightlessness evolved independently in every major ratite lineage (a minimum of six times), but gigantism has evolved independently at least five times as well. One hypothesis they offer for size differences within palaeognathae is based on each ancestral species’ time of arrival to its home landmass. The smaller kiwis and tinamous were both present alongside larger paleognaths (the moas and rheas respectively) that are not their closest relatives. 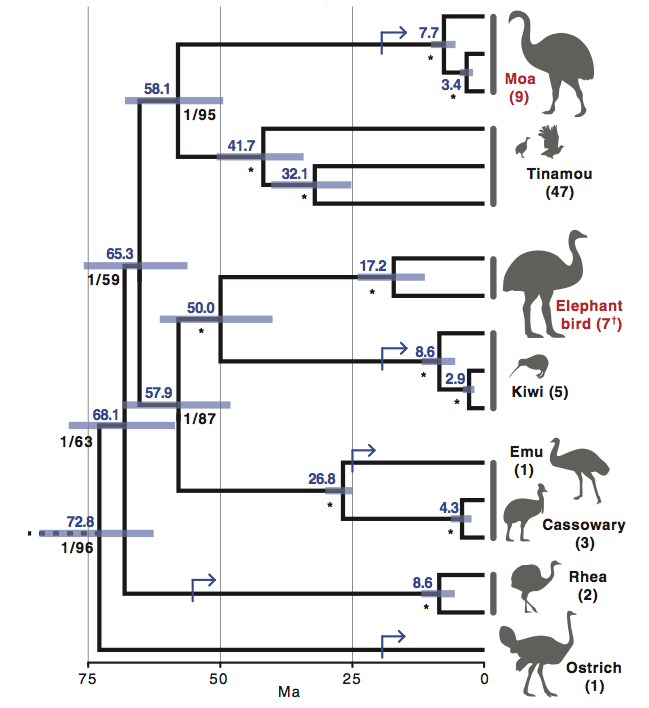 The authors posit that upon the arrival of the kiwi and tinamou ancestors, the moas and rheas had already filled the large flightless herbivore/omnivore niche. Figure 2. Palaeognathae phylogeny as presented in Baker et al. (2014). This tree was created using more loci than any previous tree, lending further support for the moa-tinamou clade. For moas, mitochondrial genomes have been available for over a decade, but nuclear aDNA from these species has been lacking. Baker and colleagues (2014) were able to recover, for the first time, a large number of nuclear loci (nearly 1500, totaling almost 1 million bases) from an extinct little bush moa. One of the largest challenges associated avian phylogenetics is related to incomplete lineage sorting, which arises when ancestral variation is retained during speciation and creates a discrepancy between individual gene trees and the overall species tree. Due to incomplete lineage sorting, low species number and additional complex processes (such as lineage-specific discrepancies in evolutionary rate), the deepest nodes of the palaeognathae phylogeny have been difficult to resolve. By including a much larger number of loci than previously assessed for the moa, the authors were able to combat these issues and strengthen the support for a previously suggested moa-tinamou clade, and for palaeognathae paraphyly (Figure 2, above). Both of this year’s palaeognathae phylogeny papers have once again added to the story of the oldest of all modern bird lineages using nuclear, mitochondrial and ancient DNA. As more ratites and tinamous are slated to have their genomes sequenced in the coming months, the field eagerly anticipates a fuller understanding of the phylogeny and the history of flight within this captivating group of birds. Phil Grayson is a graduate student in the Organismic & Evolutionary Biology department at Harvard University. Compelling that without exception, palaeognathae hatchlings are capable of not only swimming but also diving within days of hatching. Could it be possible that these creatures evolved on floating grassbergs, part of the Antarctic freshwater grass sea?